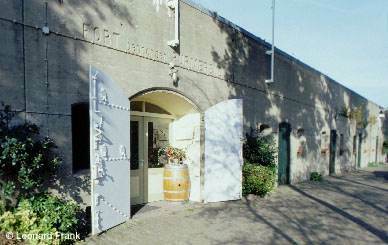 The Defence Line of Amsterdam was built between 1883 and 1920 by the Ministry of War. It consists of flooded areas (inundations) and thirty six forts, two coastal forts, two fortresses, three batteries and two permanent and two temporarily coastal batteries, some of which were planned but never built. It is the only example of a militairy defense system based on water control. If necessary, the polders could be covered with 0.5 to 1.5 meters of water within 48 hours; too deep for infantry but too shallow for boats.